This is Part 1 of a 3 part series. Part 2 will talk about the Technical Aspects of Optimizing Your Blog Post and Part 3 will talk about Linking Strategies for Your Blog Posts This post is about the functional aspects of optimizing your blog posts for SEO. The phrases that I’ll use for blogging refer to working with a WordPress blog but you can adapt this to any other blogging you’re doing. So you’re blogging. You’re putting content out, your writing about great subjects, you have excellent updates but you’re just not getting any traffic. Why is that? Well, there’s not just one reason, which is why we put together this 3 part series. 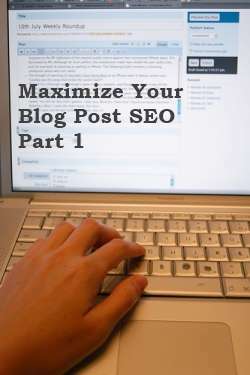 Optimization of your blog must be not only for search engines but only for your visitors. If my blog just looks great to search engines, it won’t do much if a visitors comes to the site and automatically leaves. Everything we do in this series will have a reason for doing it for search engines and a reason for doing it for your visitors. The title of your blog post is the first thing that most people see when they visit your post. This title needs to be captivating, include relevant keywords (if possible), and accurately describe your blog post. Accurately describe the post – Make sure that someone has a fair idea of what your post is about by the title. Include relevant keywords – Include keywords related to your business or site but don’t overdo it. Visitors and search engines can tell when keywords are place unnaturally. Limit the length to around 5 words – Anything much longer than 5 words is not a concise title that will get your attention, it’s a sentence. Keep your title easy to read and to display. Entice Visitors to click – If you just saw the title of your blog post, would you click on it? Add a little bit of marketing and flair to your title. Categories are used functionally by users to find other related posts. They should be more of a general subject that will be delved into in more detail in your posts. Having a category of “Detroit” may be too general and having a category of “Opening Day” may be too specific but having a category of “Detroit Events” is general and specific enough to be useful. Accurately describe the category in 2 words. Very limited exceptions call for 3 word categories. Select only 1 category for each post with limited exceptions of selecting 2 categories. Reuse categories that have been created before. Tags are like a more descriptive category. They should not include the same keywords as a category and should be more about specifics in the blog post. If I’m writing about the Winterblast, “winterblast” might be a good tag and “Detroit Events” would be a good category. Usually you will want to tag the post with no more than 3 tags but never use more than 5. Here is a quick checklist you can use for the functional aspects of your blog post when you’re creating it. Descriptive and enticing title with around 5 words. Select 1 category (2 at very most) and make the category general which can be reused. Enter/select 3 tags (5 at very most) to describe the post and category in more detail. Reuse tags. Tags should not be the same or more general than the category. Keep an eye out for Part 2 and Part 3 in the coming weeks. Let me know if you have any questions about the tips above.